Experience quality Southwest Idaho accommodations at the Elkhorn Bed and Breakfast on Mesa Hill, 6 miles south of Council, Idaho. Southwest Idaho is paradise for the outdoorsman; hunting, fishing, bird watching, hiking, whitewater rafting and trekking are just some of the activities. 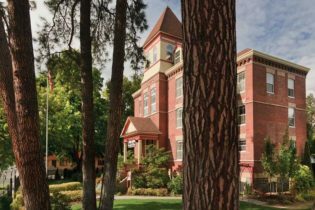 The Elkhorn Bed and Breakfast offers guests a place to relax, enjoy a great night's sleep, and wake to a delicious ranch style breakfast in the morning.Hike, bike or trek on some of the most serene trails winding through Idaho's beautiful lands along the Middle Fork of the Weiser River. 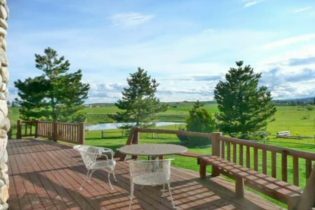 Experience a magical Southwest Idaho vacation, a memorable wedding, or a relaxing getaway in cozy, quality accommodations at the Elkhorn Bed and Breakfast on Mesa Hill, 6 miles south of Council, Idaho. Trek on your horse, mule or mountain bike on some of the most serene trails winding through Idaho’s beautiful lands along the Middle Fork of the Weiser River. Relax in front of the fireplace after a day of trekking, skiing, snowshoeing or hunting, and enjoy the ambiance of Elkhorn B&B and the panoramic mountain views surrounding it. We take the time to help our guests feel at home by offering great service! The Elkhorn Bed and Breakfast offers guests a great night’s sleep on our comfortable beds and a delicious ranch style breakfast in the morning. This area of Southwest Idaho is paradise for the outdoorsman; hunting, fishing, bird watching, hiking, white water rafting, are just some of the activities to enjoy. And it is a photographer’s dream come true! We welcome gal pals for peaceful getaways, and Starky’s Hot Springs is now open for men and women! The Elkhorn Bed and Breakfast is located just 6 miles from Council Idaho, 40 minutes from the Snake River (an entrance to Hells Canyon), 40 minutes from MC Call Idaho, Brundage Ski Resort, and 2 hours north of Boise Airport. Welcome to the Greyhouse Inn Bed and Breakfast; Salmon River country's best. 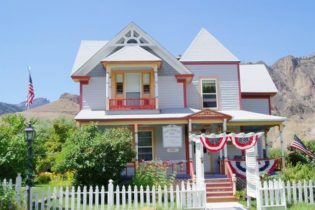 The Greyhouse Inn is located in Idaho’s Central Mountains; smack dab between the Salmon River Mountains and the Lemhi Range. Oh yes!, and we can almost see the Bitterroots from here. This is a nature-lover’s paradise with activities for all ages including white water river rafting, hiking, salmon fishing, hunting and exploring local history. Looking for lodging at a child friendly hotel? We invite you to choose our bed and breakfast; the Greyhouse Inn Bed and Breakfast. Sharon and David Osgood, innkeepers at the Greyhouse Inn Bed and Breakfast, extend their warmest heartfelt greetings to all. We will do our upmost to make your stay interesting, warm, friendly and comfortable. And that isn’t all. Wait until you sit down to our full country breakfast of berry or banana pancakes, Belgian waffles, and fresh ranch eggs, served with juice, freshly ground coffee, hot chocolate, tea or milk. Take a look at the variety of accommodations we offer in our country inn: cozy, charming rooms in the Victorian house. Or, if privacy is to your liking, try one of our cottages: the Carriage House or the Lewis or Clark Cabin. Have a family? You can bring ’em all and stay in the Lemhi Shoshone or the Trapper Cabin.